As always, I’m convinced that to get to know a culture and a people, you must experience the food as locals do. 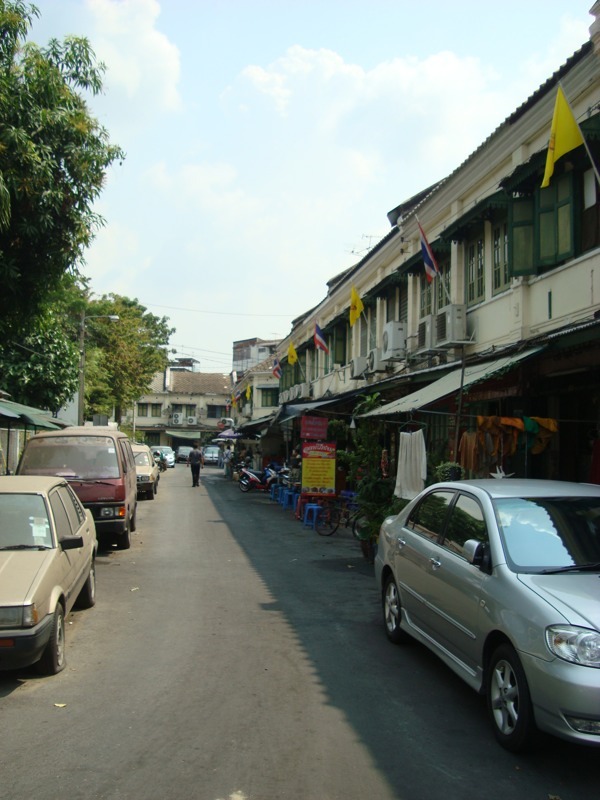 As such, I sought out an area widely considered by locals as Bangkok’s finest street food. 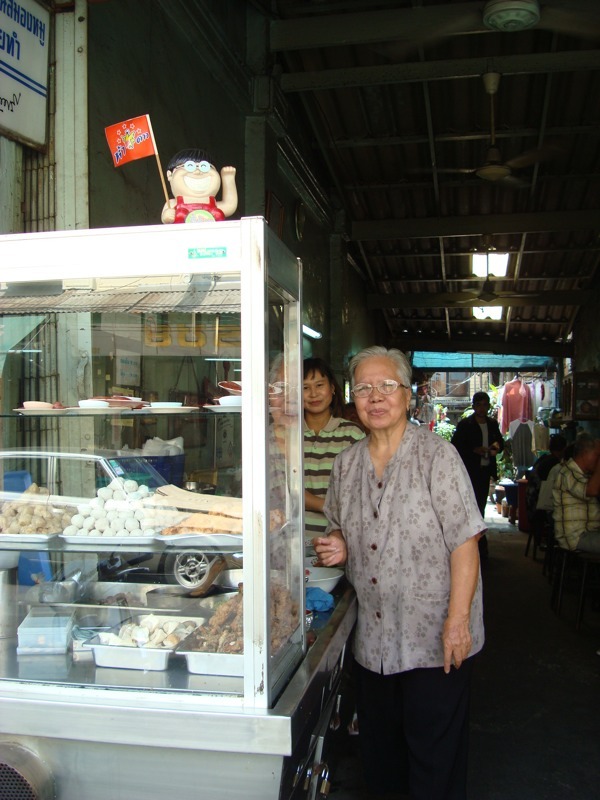 For years Thai media have reported that Saochingcha produces the most perfectly prepared dishes in a sanitary and affordable setting. When I asked the hotel concierge about it, she agreed and even told me which spot was her favorite place to eat in all of Bangkok. To find this one, look for the rotisserie stand outside and a wooden restaurant door next to it. The people here were extraordinarily nice and gave me pictures of meals so I could order. Known for their bbq chicken, I ordered just that. It came with two sauces, one very spicy and one sweet. The chicken was a little lemony with a very light, crunchy roasted skin. With a soda and blessed air conditioning, it was 122 baht, or about $4. My concierge’s favorite place to eat, it was more difficult to find. On a side street where there was’t a lick of English, I resorted to looking for people eating noodle soup. This spot is known for that in addition to stews. Run by a father and his lovely daughter, she served me a beef stew over rice with peppers on the side (I couldn’t figure out how to say soup). Again, like the chicken, it had an aromatic and slightly lemony note. With a bottle of water, it cost 48 baht, about $1.50. This by far was my most adventurous meal. When I sat, I thought of the advice my Uncle Tim gave me when I left for North Carolina after college. He said don’t eat chitlins or anything that looks like parts! My palate is a bit more sophisticated now and I don’t mind ‘parts’ but this took it to a whole new level. 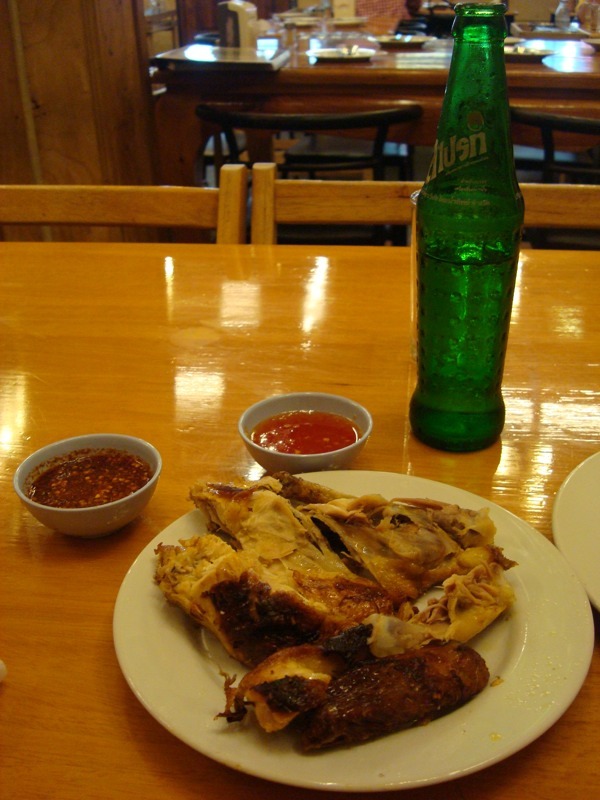 Samong only offers one dish, pig brain stew. 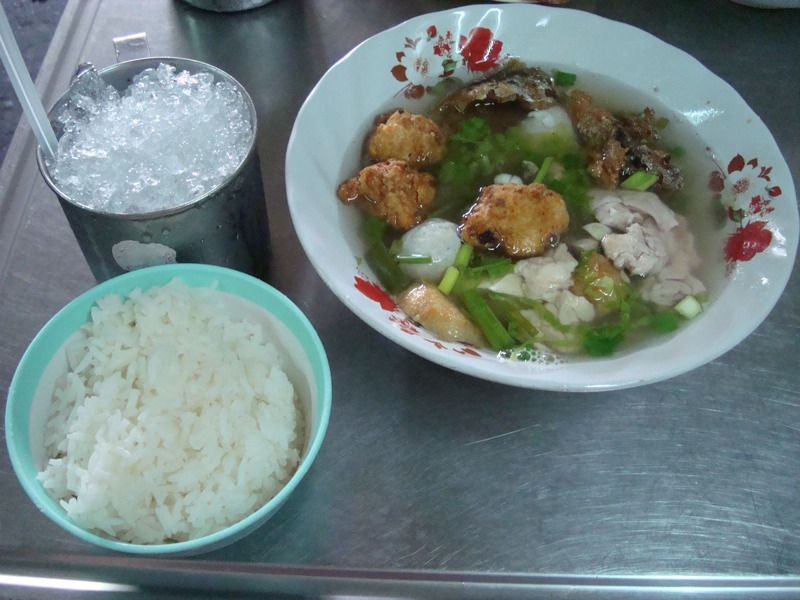 Served in a wonderful, light, slightly salty broth were pig brains, fish balls, fried fish parts, testicles, tripe, liver, and some other unidentifiable chunks. I was already full, but felt it would have been rude to not eat most of it. Surprisingly, the brain was the best part. Creamy and soft, with a delicate texture. Cost 75 baht, $2.50. By now, the lunch crowd from area businesses were descending. People in ties, men in uniform, manual workers, and ladies were all out in force. It became so full, I was elbow to elbow with people. 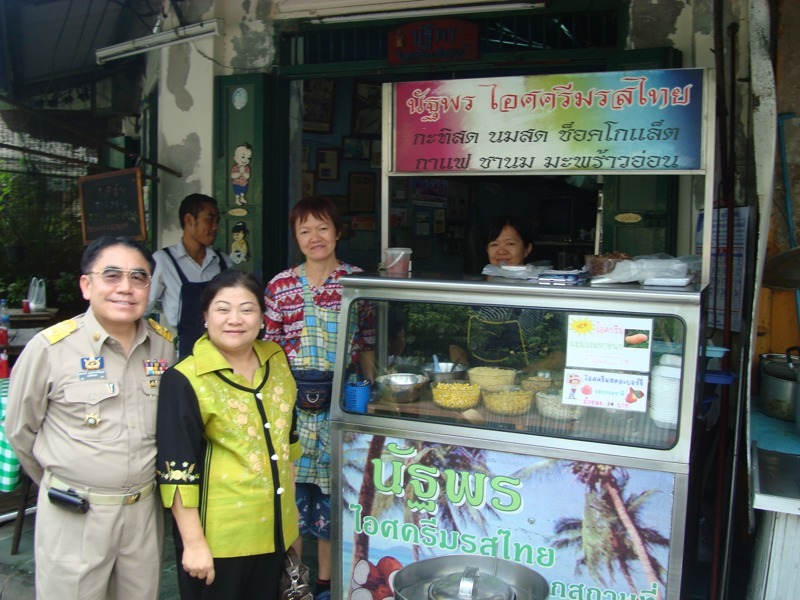 At Samong, I was next to an important looking man in a military uniform and his very nicely dressed wife. Known for their coconut ice cream, I stopped, even though I felt I couldn’t possibly choke down another bite. I did need a palate cleanser after the brain soup, though. I sat and they brought me a small bowl with peanuts on top. Not creamy like ice cream, it was more like sorbet but somehow even lighter than that. 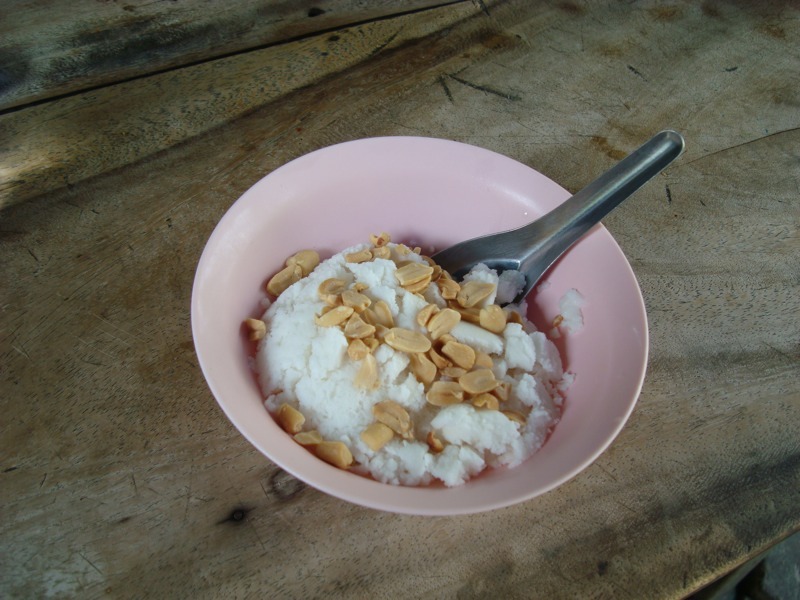 The coconut flavor wasn’t overpowering or too sweet and the peanuts gave it a perfect blend of salty and sweet. The military guy and his wife also showed up here and sat with me again. 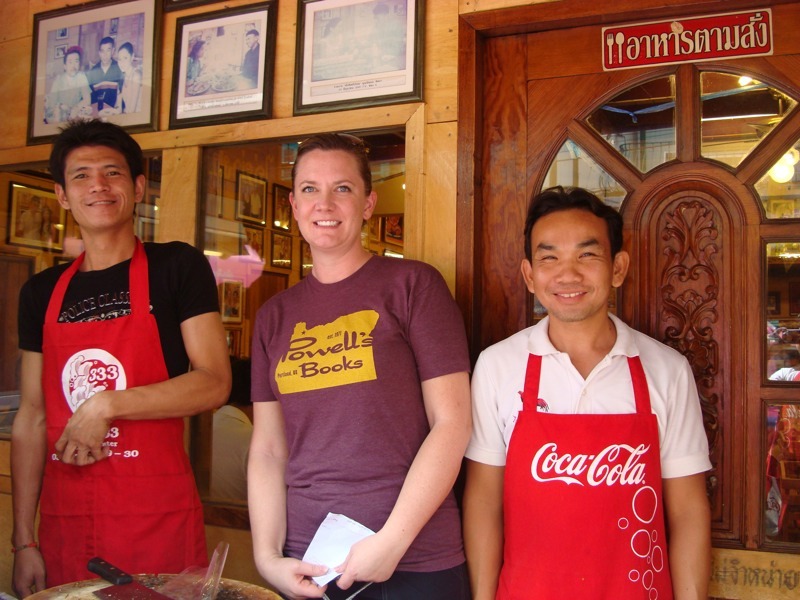 They turned out to be really nice people and I took their picture along with the woman who runs the stall. Then they wanted their picture with me! Cost 20 baht, about 60 cents. Finally I stopped for mango and sticky rice to go. 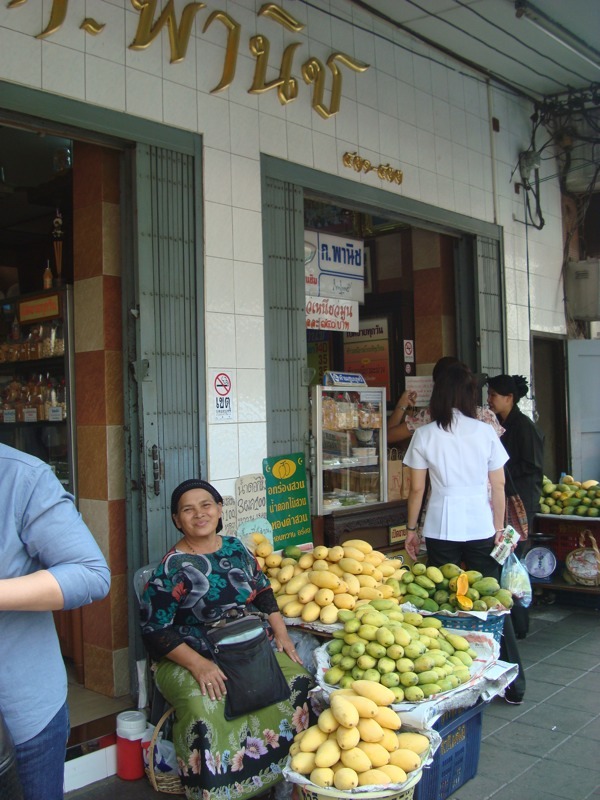 Look for the ladies selling mangos on the sidewalk, in front of an open air shop. They were kind enough to give me my loot to go, as by now my belly was so distended from all the food I looked about 5 months pregnant! Later, back in my hotel room, I finally tried what turned out to be the most divine dessert in recent memory. The rice was definitely sticky and slightly sweet, the sliced mango amazingly fresh, sweet, and perfectly ripe. It comes with a coconut sauce that is slightly sweet which you drizzle on top. Oh, I will be dreaming about this one for a while. Ultimately, this turned out to be a great way to spend a few hours. 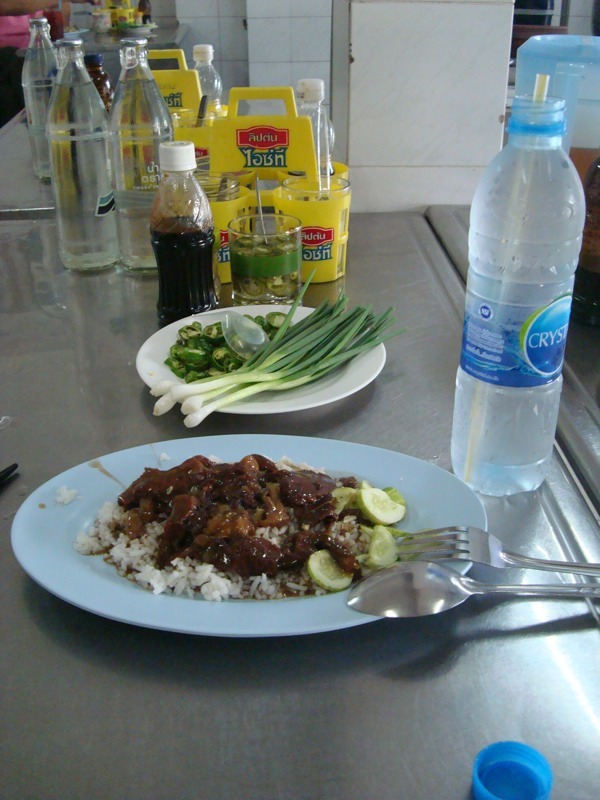 Afterwards, I felt I had a better grasp on Thai people and their food. 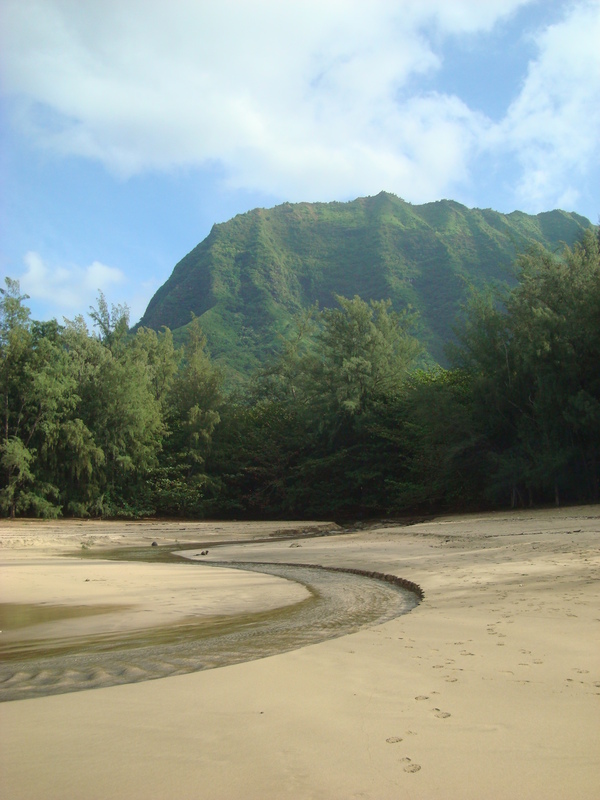 I’m proud of venturing to a place where no others like me were and my heart was warmed by the generosity of the people. Getting home was surprisingly an ordeal – I got kicked out of 2 cabs because they didn’t want to cross town back to where all of ‘my kind’ were. All just part of the adventure! I was infinitely relieved when my heartburn turned out to be only that…I had visions of a night being spent hugging the bathroom floor. Apparently the stories about it being the most hygenic street food were right! Bill Gates is a pain in my tuckus…why can’t he make his products work with the rest of the world? Sorry this post is all screwy with pictures…ipad growing pains! I am glad you are having so much fun. However, I do miss my “lunch buddy”. Can’t wait to see you when you get back in town. Enjoy my friend and remember this is “your” year to shine. I miss my lunch buddy, too! I don’t think you’d be down with eating some of the stuff I’ve been sampling, though! See you next week. Lunch Thursday with our gang? I simply couldn’t depart your website prior to suggesting that I really enjoyed the standard information a person provide to your visitors?